This guide provides instructions for policy-based actions in a Red Hat CloudForms environment, including system controls, enforcement, compliance, and events. Information and procedures in this book are relevant to Red Hat CloudForms administrators. Check all the events you want to assign to this policy. For a description of the events, see Section A.1, “Events” . Each selected action can be executed synchronously or asynchronously; synchronous actions will not start until the previous synchronous action is completed, and asynchronous action allows the next action to start whether or not the first action has completed. Also, at least one Red Hat CloudForms server in the Red Hat CloudForms zone must have the notifier server role enabled for the trap to be sent. Create compliance policies by assigning or creating a condition. Red Hat CloudForms automatically assigns the events and actions to the compliance policy as opposed to a control policy where you must define this yourself. The entity type (VM or host, for example) compliance check event is assigned to the compliance policy. A compliance policy runs the mark as compliant action when the virtual machine or host passes all of the conditions. If any of the conditions are not met, then the virtual machine or host is marked as non-compliant. To create a condition, see Section 1.1.5, “Creating a New Policy Condition”. Carefully plan the purpose of your policy before creating it. 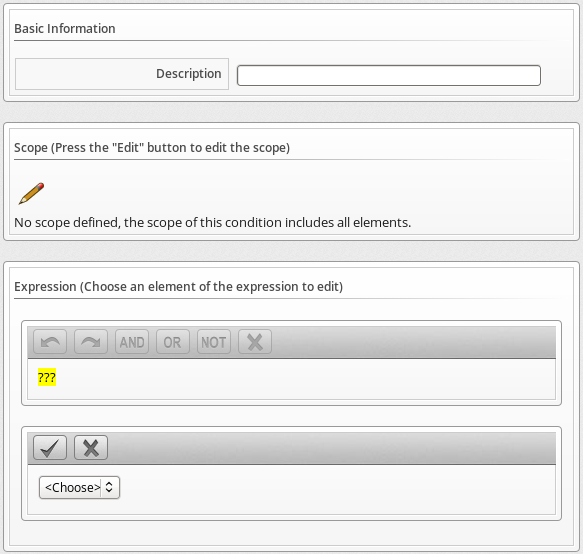 You can also use a scope expression that is tested immediately when the compliance check event triggers the policy. If the item is out of scope, then the policy does not continue on to the conditions, and none of the associated actions run. You can create a new condition by clicking (Configuration), (Create a new Condition assigned to this Policy), as described in Section 1.1.5, “Creating a New Policy Condition”. You can use an existing condition by clicking (Configuration), (Edit this Policy’s Condition assignments), as described in Section 1.1.6, “Editing Policy Condition Assignments”. Red Hat CloudForms Control provides the ability to create a compliance condition that checks file contents. Use this to be sure that internal operating system settings meet your security criteria. Regular expressions are used to create the search pattern. Test your regular expressions thoroughly before using them in a production environment. Note that to search file contents you will need to have collected the file using a host analysis profile. See Hosts in Managing Infrastructure and Inventory for instructions. To schedule, you must have EvmRole-administrator access to the Red Hat CloudForms server. Navigate to Compute → Infrastructure → Virtual Machines, select the virtual machine you want to check for compliance. Navigate to Compute → Infrastructure → Hosts, click the host you want to check for compliance. Navigate to Compute → Containers → Replicators, select the replicator you want to check for compliance. Navigate to Compute → Containers → Pods, select the pod you want to check for compliance. Navigate to Compute → Containers → Container Nodes, click the node you want to check for compliance. Navigate to Compute → Infrastructure → Container Images, select the container image you want to check for compliance. 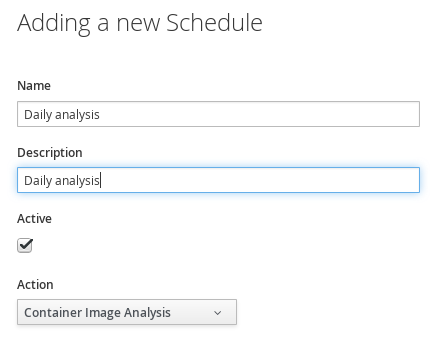 You can create a condition either from within a policy screen or by going directly to the expression editor in the Red Hat CloudForms console. You need to define a description and an expression element. The expression element defines what criteria you want to use to test the condition. Write an entry to the Red Hat CloudForms log. For use with Red Hat CloudForms automate. It enables you to run tasks and notifications automatically. Used with Red Hat CloudForms automate. You can create a custom action using the Red Hat CloudForms console. Enter a description and action type. Procedures for each type of action are shown in the sections below. When you create a policy, you can associate actions with specific events. For use with Red Hat CloudForms automate. Use this action for assigning specific analysis profiles to virtual machines. You must create an analysis profile before assigning it to an action. You can only assign this action to an analysis start event. See Configuration in General Configuration for information on how to create analysis profiles. Select Assign Profile to Analysis Task from Action Type. Select a profile from the Analysis profiles. Select Create a Snapshot from Action Type. Type in a Snapshot Name. Click Add when you are finished. Select Delete Snapshots by Age from Action Type. Select the age of snapshots to delete. Click the Actions accordion, and click (Configuration), (Add a new Action). Select Inherit Parent Tag from Action Type. Select the type of parent item to inherit from in Parent Type. Check all categories that you want inherited. Select Reconfigure CPUs from Action Type. Select a number from Number of CPUs. Select Reconfigure Memory from Action Type. Type in a new value for Memory Size. Select Remove Tags from Action Type. Check the category of tags you want to remove. Use this action to run an Ansible Playbook against your inventory. You must first sync a playbook repository and add an Ansible Playbook service catalog item. See Automation Management Providers in Managing Providers for more information. Select Run Ansible Playbook from Action Type. Select the playbook catalog item to run from Playbook Catalog Item. Check the inventory against which you run the Ansible playbook. If Specific Hosts is selected, provide the IP or DNS names. To send emails from the Red Hat CloudForms server, you must have the notifier server role enabled and have defined settings for SMTP email. For further information regarding SMTP, see General Configuration. Select Send an E-mail from Action Type. Type in a From E-mail Address and To E-mail Address. To send SNMP traps from the Red Hat CloudForms server, you must have the Notifier server role and the SNMP daemons enabled. For information on enabling SNMP, see General Configuration. Enter a Description for the action. Select Send an SNMP Trap from Action Type. Type in the IP for the host to send the trap to, select the version of SNMP that you are using, and type in the Trap Object ID. Type in multiple hosts if you require the trap sent to multiple SNMP hosts. If using SNMP V1, you are prompted for a Trap Number. Type 1, 2, or 3, based on the appropriate Suffix Number from table below. If using SNMP V2, you are prompted for a Trap Object ID. Type info, warning, or critical, based on the table below. Type in the variables that you require in your message. When adding an SNMP action, be sure to set it as asynchronous. The custom attribute must already exist in vCenter. See vCenter documentation for instructions. 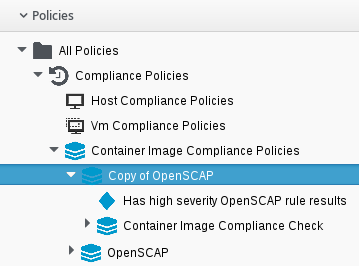 In this example, an attribute called Red Hat CloudForms policy already exists. 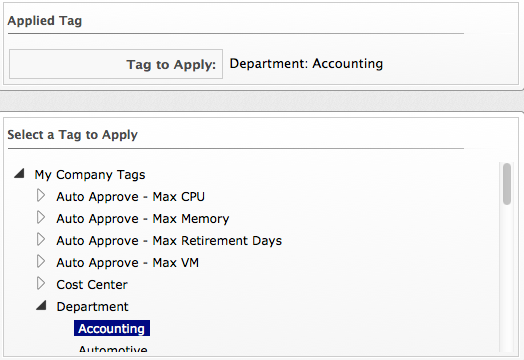 Select Set a Custom Attribute in vCenter from Action Type. Type in the Attribute Name and Value to Set. Select Tag from Action Type. Click on the appropriate tag to apply from the list provided. Edit an action to modify its properties. You cannot edit any of the default actions supplied with Red Hat CloudForms. Only actions that you create can be changed. Note that when you view an action, you can see what policies it has been assigned to. Click the Actions accordion, then click on the action you need to edit. Click (Configuration), (Edit this Action) on the detail view of the action. The action is modified and can be added to a policy. If the action is already party of a policy, the policy is automatically updated. Delete unused actions to keep your environment uncluttered. You cannot delete default actions or actions that are currently assigned to a policy. The delete button is unavailable if the action is in use. Click the Actions accordion, click on the action you need to remove. Click (Configuration), (Delete this Action) on the detail view of the tree. Policy profiles are groups of policies that you can assign wholesale to virtual machines, providers, clusters, hosts, resource pools, replicators, pods, container nodes, and container images. Policy profiles provide a framework for easily managing and assigning different levels of security, across various types of cloud resources. 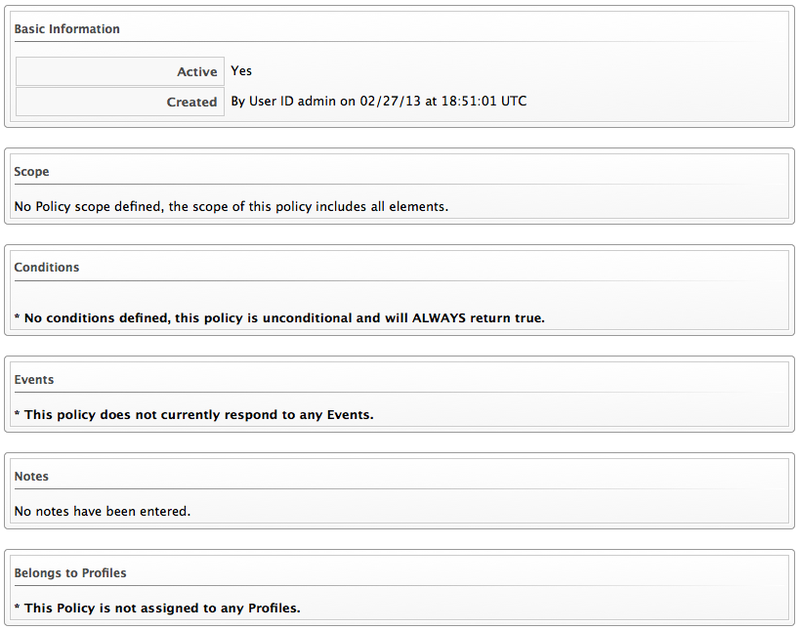 Click on the Policy Profiles accordion, then click (Configuration), then (Add a New Policy Profile). In the Basic Information area, type in a unique description for the policy profile. From Available Policies in the Policy Selection area select all the policies you need to apply to this policy profile. Use the Ctrl key to select multiple policies. Click to add the Policies. Add to the Notes area if required. The policy profile is added. You can now assign the policy profile to providers, hosts, and repositories. In addition, you can verify that the virtual machine complies with the policy profile using the Resultant Set of Policy feature. Remove policy profiles that you no longer need. This does not remove the policies associated with the policy profile. Click on the Policy Profile accordion, then click the policy profile you want to remove. Click (Configuration), (Remove this Policy Profile). 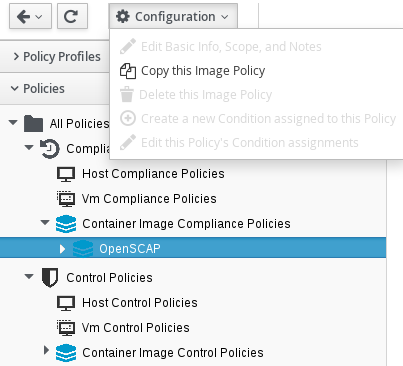 Before assigning a policy profile to a virtual machine, use the Red Hat CloudForms controls policy simulation feature to determine if a virtual machine passes a policy profile. Navigate to Compute → Infrastructure → Virtual Machines, select the virtual machines you need to evaluate. Click (Policy), and then click (Policy Simulation). From the Select a Policy Profile to add dropdown, click the policy you need to apply to the selected virtual machines. The virtual machine thumbnail displays in the Policy Simulation area. A check sign in the lower right quadrant of the virtual thumbnail shows that the virtual machine passes policy. A minus sign in the lower right quadrant of the virtual thumbnail shows that the virtual machine fails policy. Click on a virtual machine in the Policy Simulation area to see its details. Expand a policy profile by clicking on it to see its member policies and the status of the conditions. Check Show out of scope items to show all conditions, whether or not the virtual machine passes the scope part of the condition. Uncheck it to hide conditions where the scope part fails. Next to Show policies, check Successful to show policies that are passed and check Failed to see the policies that have failed. The default is to show both. Items in green text passed the condition. Items in red text failed the condition. Items in red italics failed the condition, but do not change the outcome of the scope. If you evaluate multiple policy profiles, you can see both policy profiles and a tree expanding down to their conditions. After creating your policy profiles, you are ready to evaluate and assign them. Assign a policy profile to a virtual machine to apply the policy profile to a specific virtual machine, independent of its related host, provider, or repository. Assign a policy profile to a provider to apply the policy profile to all virtual machines, hosts, replicators, pods, container nodes or container images registered to that provider. 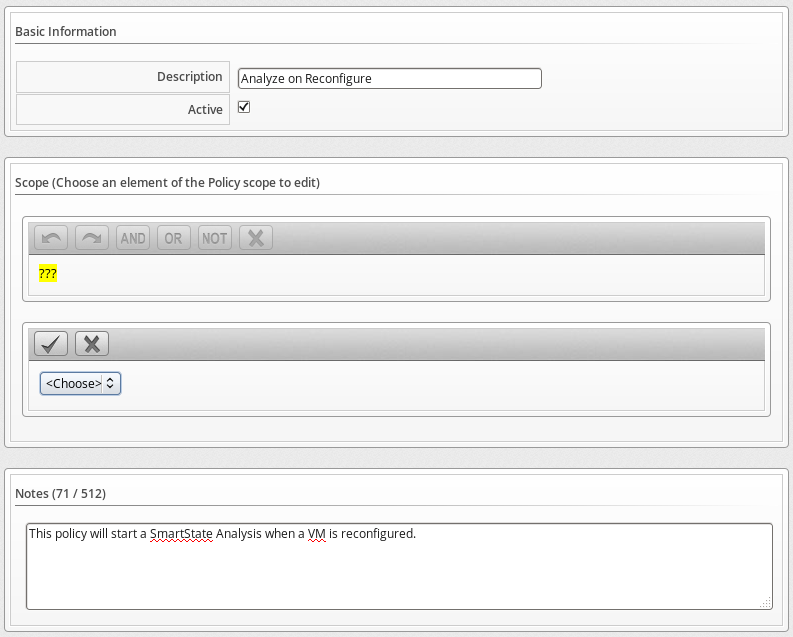 Assign a policy profile to a replicator to apply the policy profile to that specific replicator. Assign a policy profile to a pod to apply the policy profile to that specific pod. Assign a policy profile to a container node to apply the policy profile to that specific node. Assign a policy profile to a container image to apply the policy profile to that specific image. Assign a policy profile to a cluster to apply the policy profile to all virtual machines or hosts assigned to that cluster. Assign a VM policy profile to a host to apply the policy profile to that specific host or all virtual machines registered to that host. Assign a VM policy profile to a resource pool to apply the policy profile to all virtual machines or hosts assigned to that resource pool. Navigate to Compute → Infrastructure → Providers, verify the provider you need to assign the policy profiles to. Click (Policy), and then click (Manage Policies). From the Select Policy Profiles area, you can click on the triangle next to a desired policy profile to expand it and see its member policies. Check the policy profiles you require to apply to the provider. It turns blue to show its assignment state has changed. Navigate to Compute → Infrastructure → Providers, check the providers you want to remove the policy profile from. Uncheck the policy profile you need to remove. It turns blue to show that its assignment state has changed. Navigate to Compute → Infrastructure → Clusters, check the clusters you need to assign policy profiles to. Check the policy profiles you need to apply to the cluster. It turns blue to show its assignment state has changed. Navigate to Compute → Infrastructure → Clusters, check the clusters you need to remove the policy profiles from. Uncheck the policy profiles you need to remove. It turns blue to show that its assignment state has changed. Navigate to Compute → Infrastructure → Hosts, check the hosts you need to assign policy profiles to. From the Select Policy Profiles area, click on the triangle next to a desired policy profile to expand it and see its member policies. Check the policy profiles you need to apply to the host. It turns blue to show its assignment state has changed. Navigate to Compute → Infrastructure → Hosts, check the hosts you need to remove the policy profiles from. Navigate to Compute → Infrastructure → Virtual Machines, check the virtual machines you need to assign policy profiles to. Check the policy profiles you need to apply to the host. It will turn blue to show that its assignment state has changed. Navigate to Compute → Infrastructure → Virtual Machines, check the virtual machines you want to remove the policy profile from. Navigate to Compute → Infrastructure → Resource Pools, check the resource pools you need to assign policy profiles to. Click the policy profiles you need to apply to the resource pools. It turns blue to show its assignment state has changed. Navigate to Compute → Infrastructure → Resource Pools, check the resource pools you need to remove the policy profiles from. Navigate to Compute → Clouds → Providers and check the provider you need to assign the policy profiles to. Check the policy profiles you need to apply to the provider. The ones that are different from the previous setting will show in blue. Navigate to Compute → Clouds → Providers, check the providers you need to remove the policy profile from. Navigate to Networks → Providers, check the network provider you need to assign the policy profiles to. Navigate to Networks → Providers, check the network providers you need to remove the policy profiles from. Navigate to Compute → Containers → Providers and select the provider you need to assign the policy profiles to. From the Select Policy Profiles area, click on the triangle next to a desired policy profile to expand and see its member policies. Select the policy profiles you need to apply to the provider. It will turn blue to show the selection. Navigate to Compute → Containers → Providers, select the container providers you need to remove the policy profiles from. Navigate to Compute → Containers → Replicators and select the replicator you need to assign the policy profiles to. Select the policy profiles you need to apply to the replicator. It will turn blue to show the selection. Navigate to Compute → Containers → Replicators, select the replicators you need to remove the policy profiles from. Navigate to Compute → Containers → Pods and select the pod you need to assign the policy profiles to. Select the policy profiles you need to apply to the pod. It will turn blue to show the selection. Navigate to Compute → Containers → Pods, select the pods you need to remove the policy profiles from. Navigate to Compute → Containers → Container Nodes and select the container node you need to assign the policy profiles to. Select the policy profiles you need to apply to the node. It will turn blue to show the selection. Navigate to Compute → Containers → Container Nodes, select the container nodes you need to remove the policy profiles from. Navigate to Compute → Containers → Container Images and select the image you need to assign the policy profiles to. Select the policy profiles you need to apply to the image. It will turn blue to show the selection. Navigate to Compute → Containers → Container Images, select the container images you need to remove the policy profiles from. From Compute → Clouds → Instances, check the instances you want to assign policy profiles to. Check the policy profiles you want to apply to the instances. It turns blue to show its assignment state has changed. Navigate to Compute → Clouds → Instances, check the instances you need to remove the policy profile from. You can disable one policy in a profile without removing it from the policy, perhaps for trouble shooting purposes or because the policy is not required temporarily. Click the Policies accordion, then navigate to the policy that you need to disable or navigate to the policy from the policy profile. Click (Configuration), (Edit Basic Info, Scope, Notes). After the Policy Profiles are assigned, you can see the final result of the resolution of all policies based on which Events occur. Based on the result, you can adjust your Policies. To view RSOP, go to the control area in the Red Hat CloudForms console. Navigate to Control → Simulation. From the Event Selection area, select a type of event, and then the specific event you need the result for. From the VM Selection area, select the virtual machine from a provider, cluster, host, or a single virtual machine. Events are triggers that cause a condition to be tested. Control provides several Events, that can be divided into functional types. Events cannot be modified. Events related to container analysis. Events related to datastore analysis. Events related to credential validation for hosts and providers. Events related to assigning and removing company tags from an infrastructure object. Events related to checking compliance policies. Events related to the connection state of a host and status of a SmartState Analysis on a host. Events associated with a change in configuration of a virtual machine. These include, but are not limited to, clone, create, template create, and settings change. Events such as virtual machine discovery, provisioning, and virtual machine retirement. Events associated with power states or locations of virtual machines and virtual desktop machines. These include, but are not limited to, power off, power on, reset, resume, shutdown, and suspend. Events associated with service lifecycle. These include, but are not limited to, provisioning completed, start request, started, stop request, stopped, retirement warning, and retired. Each type has a set of events that you can select to trigger the checking of a condition. Check the condition when an analysis of a container image completes. Check the condition when a new container image is discovered. Check the condition when a compliance check is performed on an image. Check the condition when an image passes a compliance check. Check the condition when an image fails a compliance check. Check the condition when a node fails to mount a volume for a pod. Check the condition when a node’s disk capacity is invalid. Check the condition when a node is not ready. Check the condition when a node is not schedulable. Check the condition when a node is ready. Check the condition when a node is schedulable. Check the condition when a node reboots. Check the condition when a compliance check is performed on a node. Check the condition when a node passes a compliance check. Check the condition when a node fails a compliance check. Check the condition when a pod with specified deadline exceeds it and is terminated. Check the condition when scheduling a pod fails. Check the condition when getting a pod to its desired state fails (a frequent reason is failure to download the image). Check the condition when a pod validation fails. Check the condition when a pod hostPort conflict occurs. Check the condition when there is an insufficient free CPU in a pod. Check the condition when there is an insufficient free memory in a pod. Check the condition when a pod nodeSelector mismatches. Check the condition when a pod is out of disk space. Check the condition when a pod is scheduled onto the node. Check the condition when a compliance check is performed on a pod. Check the condition when a pod passes a compliance check. Check the condition when a pod fails a compliance check. Check the condition when a replicator fails creating a pod. Check the condition when a replicator successfully creates a pod. Check the condition when a compliance check is performed on a replicator. Check the condition when a replicator passes a compliance check. Check the condition when a replicator fails a compliance check. Check the condition when a SmartState Analysis of datastore completes. Check the condition when a SmartState Analysis for a datastore is requested from the user interface. Check the condition when a host is added to a cluster. Check the condition when a SmartState Analysis of host completes. Check the condition when a SmartState Analysis is requested from the Red Hat CloudForms console. Check the condition when host authentication credentials are changed in the Red Hat CloudForms console. Check the condition if there is any other error connecting to the host such as ssh/vim handshaking problems, timeouts, or any other uncategorized error. Check the condition if host authentication credentials are not complete in the user interface. Check the condition if Red Hat CloudForms is able to communicate with the host and the credentials fail. Check the condition if Red Hat CloudForms is unable to communicate with the host. Check the condition when the host authentication credentials entered in the Red Hat CloudForms console are valid. Check the condition when the processing of capacity and utilization data has finished. Check the condition when a compliance check is performed on a host. Check the condition when a host fails a compliance check. Check the condition when a host passes a compliance check. Check the condition when a host connects to a provider. Check the condition when a host disconnects from a provider. Check the condition when a host is removed from a cluster. For use only with Red Hat CloudForms automate, for future use in policies. Check the condition when provider authentication credentials are changed in the user interface. For use only with Red Hat CloudForms automate, for future use in policies. Check the condition if there is any other error connecting to the provider such as ssh/vim handshaking problems, timeouts, or any other uncategorized error. For use only with automate, for future use in policies. Check the condition if provider authentication credentials are not complete in the Red Hat CloudForms console. For use only with Red Hat CloudForms automate, for future use in policies. Check the condition if Red Hat CloudForms is able to communicate with the provider and the credentials fail. For use only with automate, for future use in policies. Check the condition if Red Hat CloudForms is unable to communicate with the provider. For use only with Red Hat CloudForms automate, for future use in policies. Check the condition when the provider authentication credentials entered in the user interface are valid. Check the condition when a compliance check is performed on a provider. Check the condition when a provider fails a compliance check. Check the condition when a provider passes a compliance check. Check the condition when the service provision is complete. Check the condition when the service has been retired. Check the condition when the service is about to retire. Check the condition when the service has been requested to start. Check the condition when the service has started. Check the condition when the service has been requested to stop. Check the condition when the service has stopped. Check the condition after a company tag is assigned. Check the condition after a company tag is assigned to a virtual machine’s parent cluster. Check the condition after a company tag is assigned to a virtual machine’s parent datastore. Check the condition after a company tag is assigned to a virtual machine’s parent host. Check the condition after a company tag is assigned to a virtual machine’s parent resource pool. Check the condition when assignment of a company tag is attempted. Check the condition when a company tag is removed. Check the condition after a company tag is removed from a virtual machine’s parent cluster. Check the condition after a company tag is removed from a virtual machine’s parent datastore. Check the condition after a company tag is removed from a virtual machine’s parent host. Check the condition after a company tag is removed from a virtual machine’s parent resource pool. Check the condition when an attempt is made to remove a company tag. Check the condition when a VDI session is started. Check the condition when a VDI session is disconnected. Check the condition when a user logs on to a VDI session. Check the condition when a user logs off from a VDI session. Check the condition when a SmartState Analysis of virtual machine completes. Check the condition when a SmartState Analysis of virtual machine fails. Check the condition when a SmartState Analysis of virtual machine is started. Check the condition when a virtual machine is cloned. Check the condition when a virtual machine clone is started. Check the condition when a compliance check is performed on a virtual machine. Check the condition when a virtual machine fails a compliance check. Check the condition when a virtual machine passes a compliance check. Check the condition when a virtual machine is created. Check the condition when someone tries to delete a virtual machine from disk from the user interface. Check the condition when a virtual machine is rebooted. Check the condition when someone tries to reboot a virtual machine from the Red Hat CloudForms console. Check the condition when the operating system of a virtual machine shuts down. Check the condition when someone tries to shut down the operating system of a virtual machine from the user interface. Check the condition when a VMOTION is performed. Check the condition when a virtual machine is turned off. Check the condition when someone tries to power off a virtual machine from the Red Hat CloudForms console. Check the condition when a virtual machine is turned on. Check the condition when someone tries to turn on a virtual machine from the Red Hat CloudForms console. Check the condition when a virtual machine is provisioned. Check the condition when a virtual machine is connected to a remote console. Check the condition when a virtual machine is unregistered. Check the condition when a request is sent from the Red Hat CloudForms console to unregister a virtual machine. Check the condition when a virtual machine is renamed on its provider. Check the condition when a virtual machine is restarted. Check the condition when a virtual machine is restarted from the Red Hat CloudForms console. Check the condition when a virtual machine retirement request is created from Red Hat CloudForms. Check the condition when a virtual machine is retired. Check the condition when a warning threshold is reached for retirement. Check the condition when the settings of virtual machine are changed. Check the condition when a snapshot is completed. Check the condition when someone tries to create a snapshot of a virtual machine from the user interface. Check the condition when a snapshot creation is started. Check the condition when the operating system of a virtual machine goes to standby. Check the condition when someone tries to put the operating system of a virtual machine in standby from the Red Hat CloudForms console. Check the condition when a virtual machine is suspended. Check the condition when someone tries to suspend a virtual machine from the Red Hat CloudForms console. Check the condition when a virtual machine template is created.